Robert Nicholas, age 71 of Olney, passed away at 9:35 PM on Friday, April 20, 2018 at Carle Richland Memorial Hospital in Olney. Funeral service will be at 1:00 PM on Friday, April 27, 2018 in the chapel of Thrasher Family Funeral Home in Olney. Visitation will be from 11 AM – 1 PM in the chapel of Thrasher Family Funeral Home. Burial will be at South Bend Cemetery in rural Jasper County. Pastor Steve Wingert and the Richland County Veteran’s Organization will be officiating. Robert was born on November 13, 1946, the son of Elmer and Eva (Garrett) Nicholas. He later married Doris Wilson on November 20, 1981 in Olney. She survives. He was in the United States Army during the Vietnam War from 1967-68. 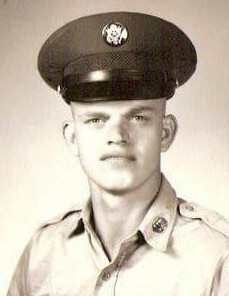 Robert re enlisted from 1970 and served until 1975. During his service he was a gunman on the Chinook helicopter as well he serviced them. He had many different trades during his life. He worked in the oil field, was a taxi driver, fixed arcade games and worked at Recycle-It. He was a member of the Olney VFW and Olney American Legion. He enjoyed fishing, camping, and hunting raccoons and rabbits. He will be sadly missed by his family, friends, and all who knew him. Robert is survived by his wife Doris Nicholas of Olney; 8 children, Angela J. Gosnell of Olney, Joseph P. Nicholas of Olney, Michael A. Nicholas of Olney, Melissa A. Scott of West Salem, Leslie A. Nicholas of South Korea, Jennifer L. Ratcliffe of Olney, Laura E. Read of Olney, and Adrian S. Nicholas of Olney; brother, Jeff Nicholas of Olney; 5 sisters, Judy Tichey-Orem of Utah, Ruth Ann Zwilling of Olney, Mary Nease of Flora, Diana Bare of Ste. Marie, Kathryn Banks of Olney; 6 grandchildren, Carson M. Biehl, Maddison L. Gosnell, Robert A. Nicholas, Vinson D.. Gosnell, Natalie O. Nicholas, Brooklynn A. Read. He is preceded in death by his parents Elmer and Eva Nicholas, son Robert Nicholas II., 4 brothers Elmer Jr., William, Bruce, and infant Howard Samuel Nicholas.